I managed to capture this photo of most of the male staff recently. They were all wearing their colourful bow ties, and looking very pleased with themselves too. Their respective wives and girlfriends were also very pleased to receive a copy of this picture, and they can now nag them to get dressed up! Definitely one for this gallery. Just looking again at this picture. If this is something that would be fitting for the service you want to arrange, then please say so. The chaps are rather keen to wear these again, even if they don’t tell you! Now recently we were instructed by another lovely family. the gentleman was a true Scot. So of course we had to have bagpipes!. The piper played as I walked to the house, and then again as we came back. Then he played again after the service and walked around the outside of the Church. Coffins are never very nice things to look at, so we have developed a handle posy, which fits snugly into the handles around to coffin. 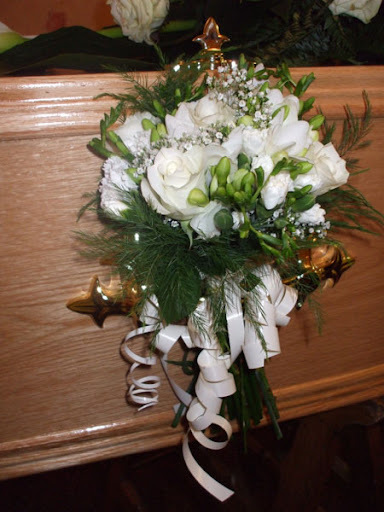 They look very effective, and are a simple but effective way for younger family members to be significantly involved with the funeral. We have them made to match the coffin spray, which is on top of the coffin. I must add some more pictures to help you. They say stranger things happen at sea, and I suppose they may well do. However in this case the family got the bit well and truly between their teeth and brought out the pet donkeys to say goodbye to their owner. The family were comforted, and it made this funeral start off in a very special way. It takes courage to make things different, and it can really help. This family very kindly gave me permission to take pictures for the website. Another first for the gallery. Every now and then you get a really lovely rose, and this is one of them. I just felt I had to include this picture, and the larger one of the tribute it came from, as it is so pretty.